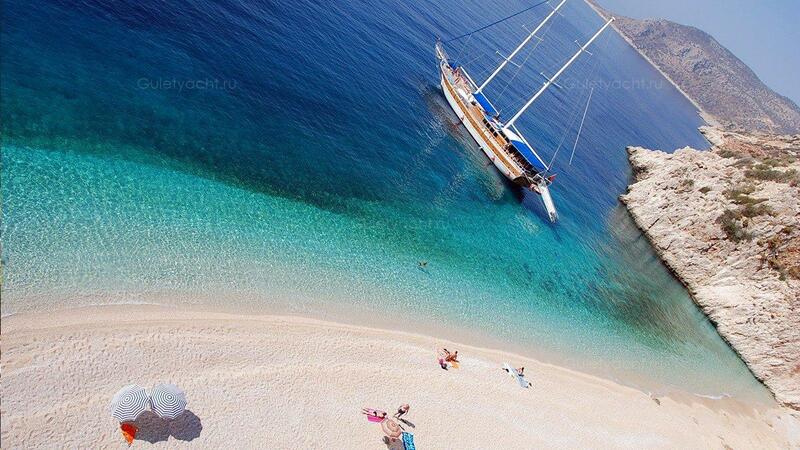 Clients for a blue cruise can board their yacht charter in mid-afternoon in Fethiye. The City is in the heart of a beautiful region, with many beaches, islands and quiet coves. Dinner is served on board that night but there is still plenty of time to explore Fethiye because your cruise does not set sail until the next morning. 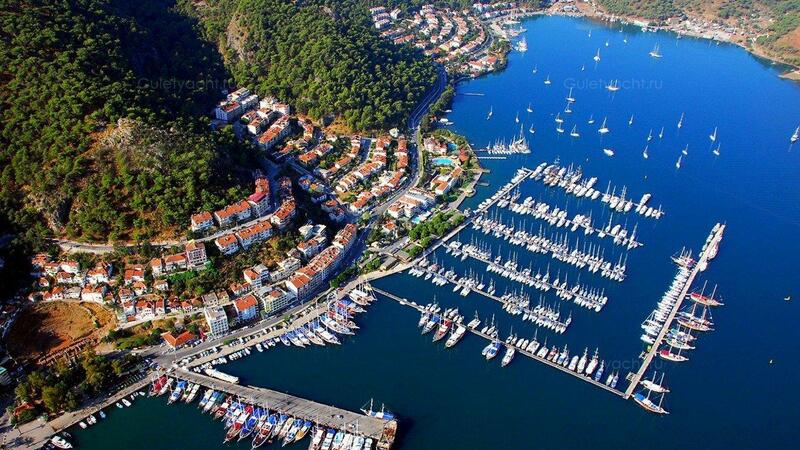 Fethiye is a city with a rich history as well as being thoroughly modern, as evidenced by the modern marina where your charter yacht is berthed. Клиенты для синего круиза могут сесть на чартер яхты в середине дня в Фетхие. Город находится в центре красивого региона, с множеством пляжей, островов и тихих бухт. Ужин подается на борту той ночью, но есть еще много времени, чтобы исследовать Фетхие, потому что ваш круиз не отплыл до следующего утра. Фетхие - это город с богатой историей, а также полностью современный, о чем свидетельствует современная яхта, где находится ваша чартерная яхта. 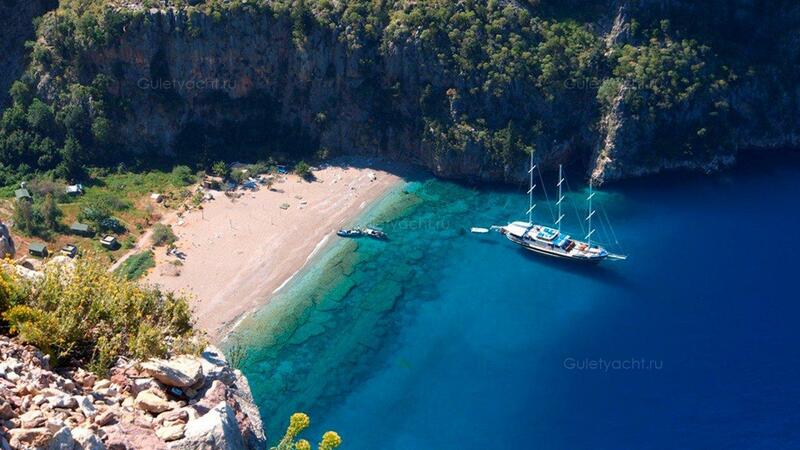 Oludeniz is one of the most photographed places on the Turquoise Coast. It has become popular with tourists because of its beach and one of the pleasures is walking on the beach after the sun sets. The lights of the harbour help to illuminate the setting by night and by day there is the contrast of colours; the blue sea, white sand and the greens of the trees. Above the lagoon is Babadagi Mountain that stands almost 2,000 metres above the level of the sea. There are great views from up there over the whole of the Fethiye Region and gliding off the top is a popular pastime with brave tourists. It takes plenty of time to get down to earth, time to absorb the wonder of the whole environment. Once down, there is little better than taking a swim in the sea which is warm for many months of the year. 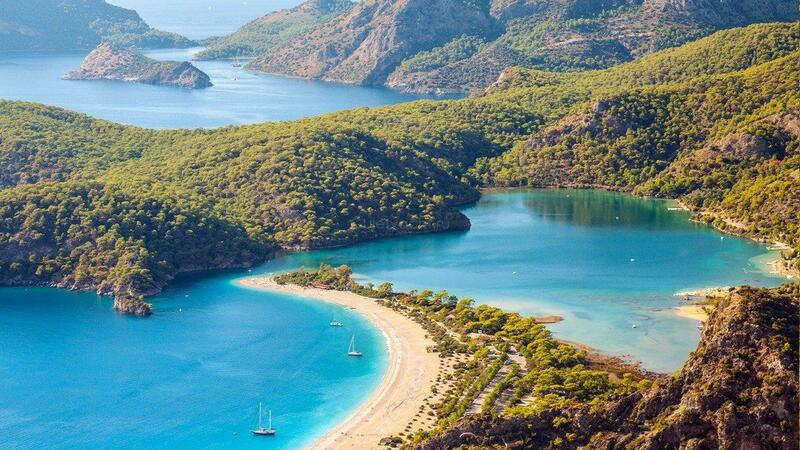 The tourist infrastructure has grown as the popularity of Oludeniz attracts more numbers; bars, cafes, restaurants and shopping. 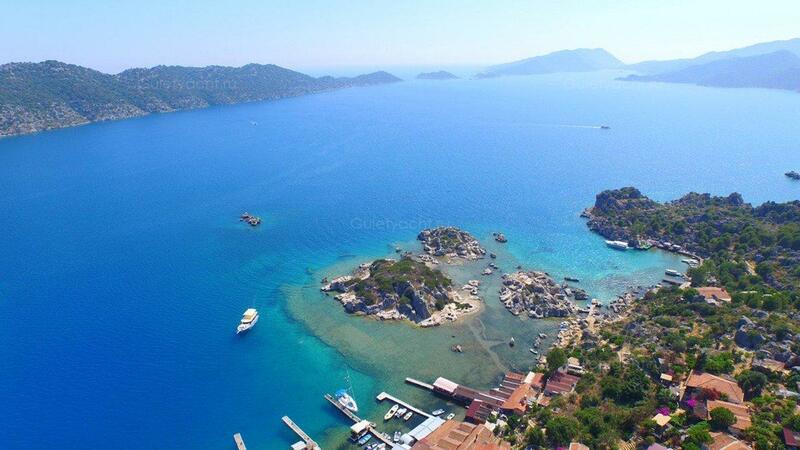 Gemiler Island off the Turkish Coast near the City of Fethiye was once an inhabited place with the ruins of homes and churches dating back to around the 4th Century. It was thought to have been the original home of St. Nicholas (Father Christmas) the Patron Saint of Sailors, and the location of his tomb. In the Middle Ages, it was a very busy place with traders heading in all directions. It continued to be important with the rich taking holidays there long before the years when ordinary people had the time or money for a holiday. The Byzantine ruins are visible from the sea incidentally. 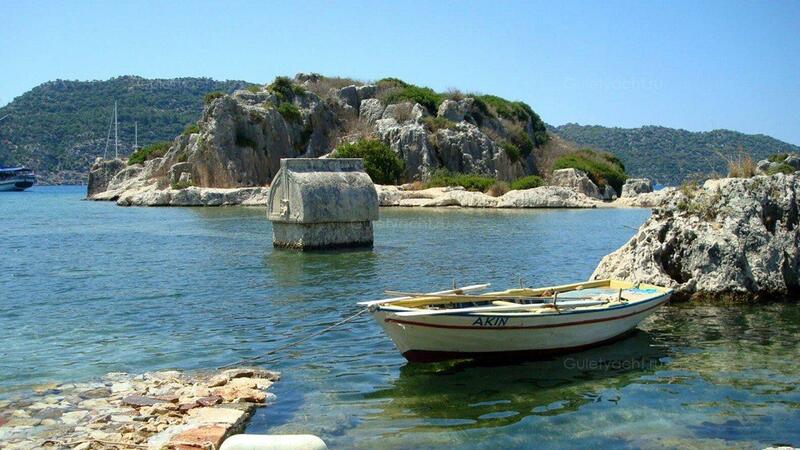 There is a crescent shaped bay on the Island which is a great place to put down an anchor. Day trippers need to leave before the sun sets but blue cruises are able to stay overnight. During the season, there is a local restaurant offering typical Turkish cuisine made from locally produced items. If you need to restock however, you should look elsewhere. Остров Джемилер с турецкого побережья недалеко от города Фетхие был когда-то заселенным местом с развалинами домов и церквей, относящихся к 4-му веку. Считалось, что это был оригинальный дом святого Николая (Дед Мороз), покровителя моряков и место его могилы. В средние века это было очень занятое место, когда трейдеры шли во все стороны. Это продолжало оставаться важным, когда богатые отдыхали там задолго до того, как у простых людей было время или деньги на праздник. Butterfly Valley is a beautiful spot close to Fethiye and only really accessible from the sea unless you are comfortable rock climbing. For a few weeks each year in the height of summer, the valley is full of butterflies and moths, the largest being the Jersey White which is actually a moth. Even when the butterflies are not there it is a peaceful place with a waterfall and a stream running though what is effectively a steep-sided canyon. Because it is relatively inaccessible, there may be no one else around and you can observe nature at first hand. People are allowed to camp there overnight but are expected to follow strict guidelines while there. Yesilkoy means Green Village in Turkish and it offers excellent shelter from the prevailing winds because of the surrounding mountains. The slopes on this hilly coast are filled with maquis and olive groves. 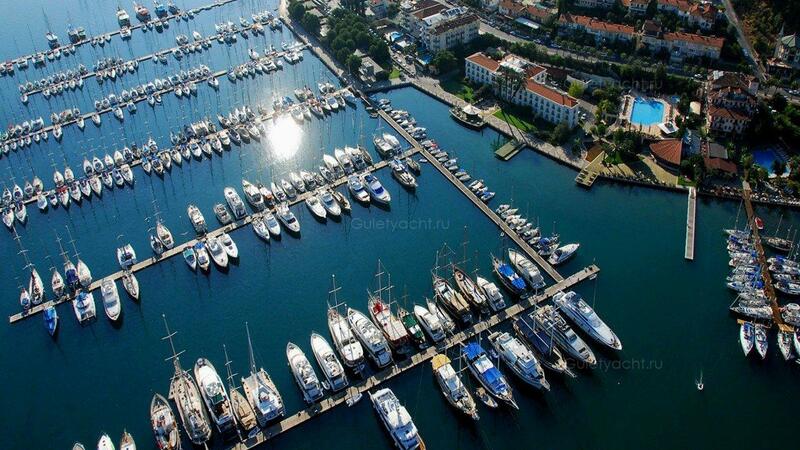 Kas, a small fishing village over the years, has developed into a small town, important for tourism, the yachts regularly visiting and using its new extended marina, and for scuba diving. 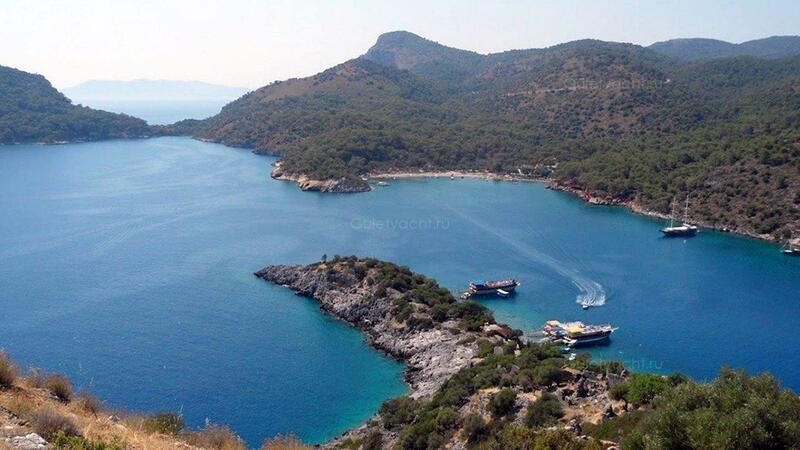 It is one of the main dive centres on the Turkey south and west coast. The rocky coastline and clear turquoise sea make a great colour contrast. The ancient ruins of Antiphellos remind visitors of its history; there is a small amphitheatre not too far from the harbour itself looking down from the town to the sea. It was an old Greek village first inhabited by the Lycians and the Greek Island of Meis is just offshore, the most easterly of the Dodecanese. It was important both to the Romans and Byzantines in olden days and remains a good base for exploring the history of the region. It has plenty of shops, bars and restaurants and is a good place for restocking during a blue cruise. 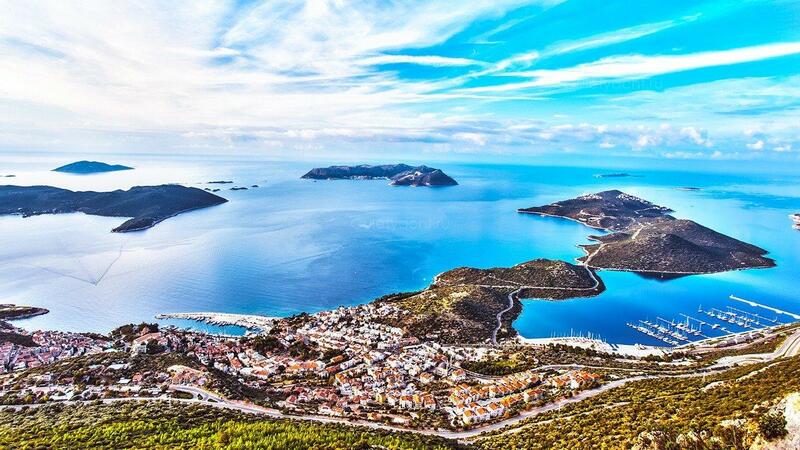 A modern road now links it west to Kalkan and beyond and east towards Antalya. Theimussa находится примерно в 36 км к востоку от Кас. Кекова, к востоку от Кас, является потрясающим регионом как из-за своей природной красоты, так и из ее богатой истории. Древний город Апериай на полуострове находится в пути, как и островки Кара и Топрак Ара. Яхты регулярно посещают залив в Кекове, недалеко от города Аполлония, который восходит к древним временам. Затопленный город, который скользнул в море после землетрясения, можно увидеть сквозь чистые воды. Замок Симена - еще одна достопримечательность, смотрящая через море в доминирующей защитной позиции. Старые летние домики все еще стоят здесь, и туристов привлекают в большом количестве, будь то плавание по морю или сейчас путешествие по современной дороге с любого направления. 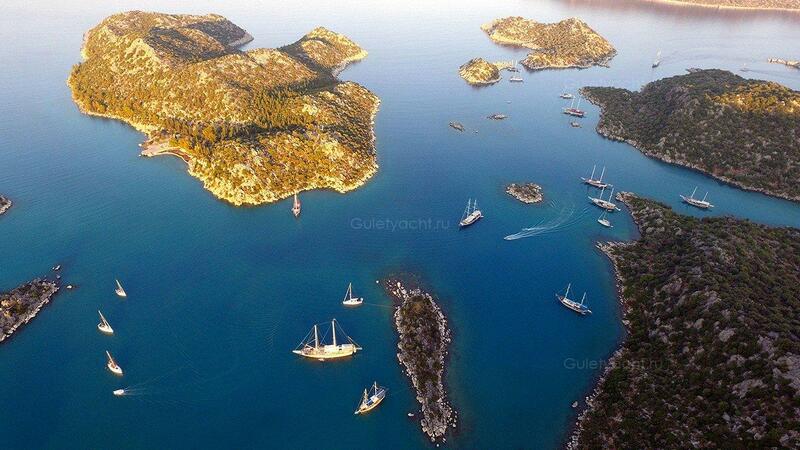 Gokkaya is beautiful with its indented coast and many offshore islands. Asirli island, Kiseli island and Kasirli island are located in front of Gokkaya and in the inlet itself smaller islands are dotted all around. Part of an old church can be seen behind the inlet of Gokkaya while close by there is the ancient city of Istlada to the east of the hill. This place is called Hoyran or Hayitli and sits within the Village of Kapakli. There is a small city wall with an entrance gate. To the east and north of the Acropolis you will see ancient rock tombs, sarcophaguses and steel shaped tombs. They belong to the Roman period and ancient ruins are even older, the 4th Century BC. The Lycian rock tombs are between Hayitli and the site of ruins. The tomb in Kapakli is known as the Monumental Tomb of Hoyran. The most important landmark in Demre on the southern Turkish Coast is the Church of St. Nicholas. It is a compelling reason for thousands to visit annually. There is plenty to see in the church from lovely mosaics to the halls and chambers. The acoustics remain impressive even today. Demre is a beautiful natural district as well as having many things that appeal to those interested in history, archaeology and religion. The smell of the spring flowers and the citrus fruits are especially appealing. 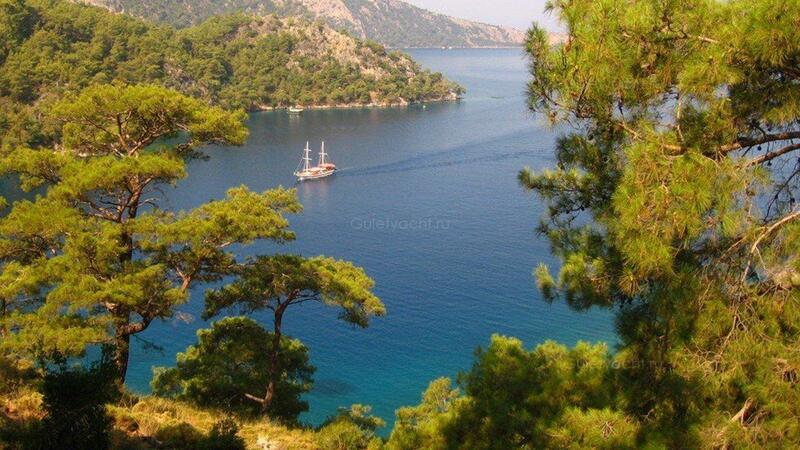 It was important during the Lycian times and was occupied by many others in the following centuries. Many yachts pass through these waters heading in either direction and many of them stop to visit Demre and see what it has to offer. 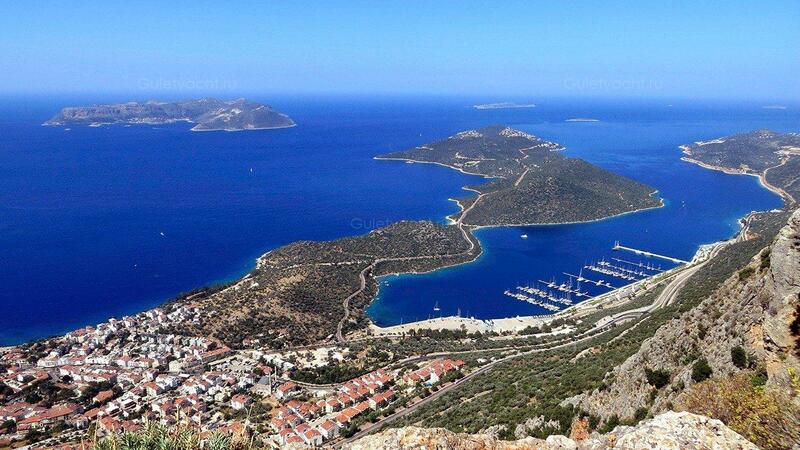 Kalkan is located below the Taurus Mountains, the beginning of a stunning stretch of coast heading easy that hugs the shore. Many of its properties are built on the slope with the small town entre located below. The harbour is small with many bars, cafes and restaurants located close by. Small shops sell traditional and souvenir goods. The locals make olive oil soap, a great little present and most are now involved in some form of tourism activity. There is plenty of colour from the flowers on balconies as well of course as the blue of the sea and sky. It is a popular resort with oversea visitors and many local properties are foreign owned. Blue cruise voyagers are regular visitors and the fish in the restaurant are likely to come out of the waters the same day. Пляж Капутас - прекрасная бухта с приятным песком и отлично подходит для купания. Он расположен ниже впечатляющего горного ущелья. Это пляж, который часто используется в туристических брошюрах и рекламных акциях для Турции, но это не привело к тому, что там собрались большие толпы. 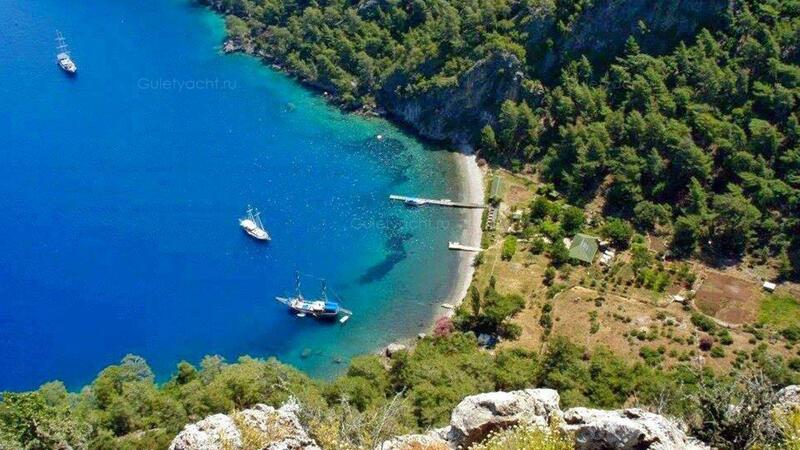 Samanlik Bay is just a short distance from the city in Fethiye, a growing city and itself a popular tourist destination. It has a wonderful natural location with the slopes covered in pine trees. The cove has clear blue waters that are inviting both to yachts and swimmers. 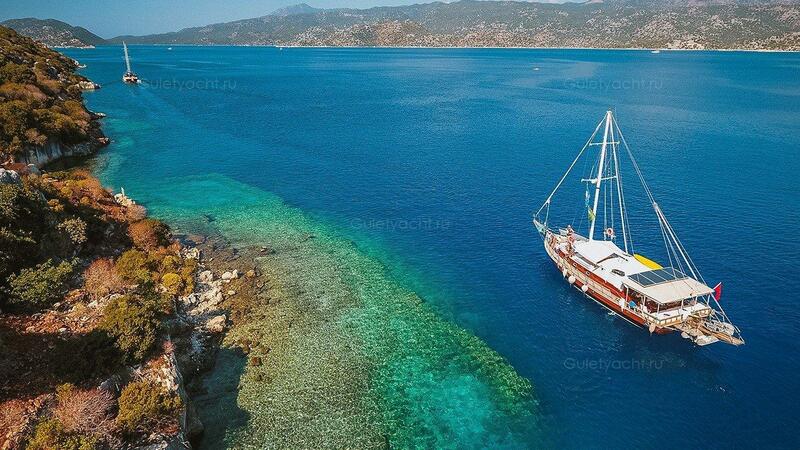 Yachts regularly anchor there even though Fethiye has many berths and is just a short journey away. Залив Саманлик находится всего в нескольких минутах ходьбы от города в Фетхие, растущего города и самого популярного туристического направления. Он имеет прекрасное природное место с склонами, покрытыми соснами. В бухте есть прозрачные голубые воды, которые приглашают как яхты, так и пловцы. Яхты регулярно запираются там, хотя в Фетхие есть много спальных мест и всего в нескольких минутах езды. Turunc Pinari is a popular place for yachtsmen. The name derives from the citrus trees a fresh water fountain. The local seafood is as fresh as it gets and there are many fish and seafood dishes on the menus of the local restaurants which find custom for locals and tourists alike. 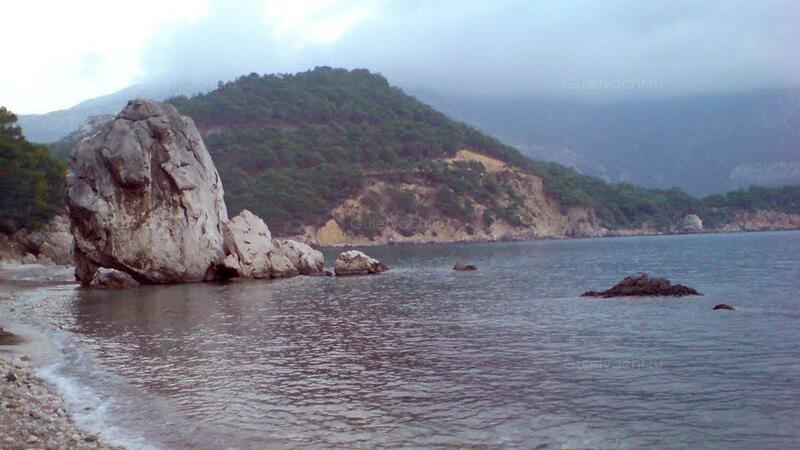 There is a walk to Turunc Pinari starting from Kaya Village but it is also accessible from the sea. Turunc Pinari - популярное место для яхтсменов. Название происходит от цитрусовых деревьев с пресной водой. Местные морепродукты так же свежи, как и добираются, и в меню местных ресторанов есть множество блюд из рыбы и морепродуктов, которые находят обычай для местных жителей и туристов. Прогулка до Турунца Пинари начинается от деревни Кая, но она также доступна из моря. You will be sorry to leave your yacht at the end of the blue cruise but you won’t be allowed to leave until you have enjoyed one final breakfast. If you did not get the chance to explore Fethiye before you joined the charter, we recommend you do so after leaving us. There is a weekly market and shopping in general is excellent. Add to that the bars and restaurants, interesting evidence of a rich history as well as the beautiful district as a whole and your time will be well-spent.